OK, kids, who's got that Minnesota macho face on? As you undoubtedly know, the forecast calls for a level of cold that we've not seen in years, potentially since 1996. TMF's proud host will assume that most of you are hoping we bag a record or two. As of this writing, The Weather Channel is posting a tidy low of -31 for St. Paul on Wednesday night. Stop for a minute and think about minus 31. That's count 'em, 63 degrees below freezing. If it reaches -31—and that's kind of hard to believe—it can warm up 62 degrees and water would still become ice. It would have to warm up 31 degrees to the point where the insides of your nose don't freeze up within seconds. Or think about it another way. In the summer, 90 degrees is commonly considered hot. If the weather were to cool down 60 degrees to 30 degrees, that would be a pretty complete transition from the height of summer to decent winter, at least for most people in the country. But then add ANOTHER 61 degrees. Seems like that would be going from winter to a difficult-to-comprehend kind of sub winter, winter cold on steroids. Enjoy the ride. Unless you're planning on visiting Fairbanks for International Falls, this is as good as it's going to get, possibly for the rest of your life. P.S. Want to have some fun? Take our single-question quiz on Facebook. 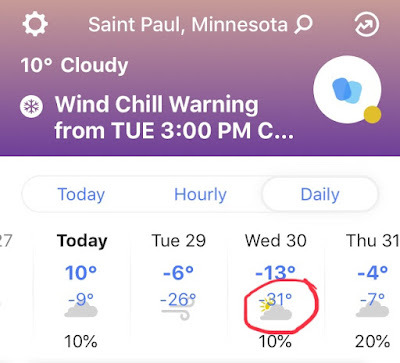 Minnesota's legendary cold has arrived. Enjoy... or not. And this article seems especially timely. The Cold is Here. Will Lasting Snow Follow? For snow lovers in the Twin Cities, it's been a depressing winter. The mild air appears to be a memory now, however, and the threat of at least "several inches" of snow (per current NWS discussion) appears in the offing. Will it be enough to make the majority of this blog's readers happy? We shall see.